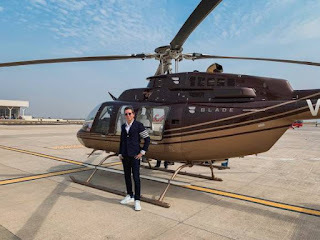 PUNE: Fly Blade Inc., the largest arranger of helicopter flights for civilian travel in the US, will start its India operations in March 2019, with services between Mumbai and Pune. The helicopters will take off from Juhu and Mahalaxmi in Mumbai. After Pune, the services will be extended to Shirdi.The American company is launching its India operations, its first outside the US, in partnership with Hunch Ventures, a Delhi-based equity investment firm that has deployed over $100 million in consumer-facing business in India. The joint venture will be called Blade India. "The service will help customers avoid large commercial airports entirely as they transform unpredictable four to eight hours drive into short 35-minute flights," said Rob Wiesenthal, CEO of Blade. The joint venture promises to price the flights "significantly lower" than private chartered jets. A private chartered jet from Mumbai to Pune can cost about $8,000. "Our service will be priced downward of what a private jet will cost," said Wiesenthal. The service's USP will be in helping customers avoid the commute to airports. “Given the challenges of building transportation infrastructure in our country, we will utilize India’s existing network of heliports to launch a UAM (urban air mobility) solution immediately," said Karanpal Singh, Founder of Hunch. The joint venture will partner with Hunch portfolio companies, which include Quintessentially, the largest luxury travel concierge in India, and a customer loyalty programme that includes 3 lakh high net worth individuals. Amar Abrol, who till May this year was heading AirAsia India, will be the CEO of the India operations. Blade India, like its US parent, will have an asset-light model and will partner with owners of helicopters to offer flight services. "We have already signed a few agreements with helicopter owners. We will be signing more," said Abrol.